As a lifestyle expert, I’m always seeking new ways to make long-standing traditions feel fresh and new. For example, the Easter Basket. I don’t know about you, but I absolutely love the idea of a grown-up Easter Basket full of my favorite treats. Creating a modern Easter basket is about so much more than eggs, bunnies and chocolate. It’s about incorporating the pastel colors of Easter past with modern “green” forward thinking Easter future. Start with a reusable item such as picnic basket or a canvas tote from LL Bean, available in a variety of sizes and colors. I like to have them monogrammed with the name or initials of the recipient to make the statement even more special, but you don’t have to do so. If you are planning on putting chocolate or candy in the basket, forgo the mass-produced bunnies and eggs that abound, and select smaller portions of unique specialty chocolates. When it comes to grownups, it’s not necessarily about the candy. You’ve probably outgrown that anyway. (Or maybe you haven’t.) Be aware of portion control for any candy you are considering. Spring leads right into summer with the bathing suits, shorts, and sundresses. Who needs to battle the bulge because of one holiday and an overflowing basket of forgettable mass-produced chocolate. Make it the good stuff you enjoy. Ultimately, you will want to include things that will change their life not change their body, unless it’s a gym membership. Instead of using regular baskets, consider things that kids can play with later. For younger children, I have used plastic pail-and-shovel sets and even small wagons. For the older child, I have often just tied the contents up in a great bandana and placed it on the end of their bed or on the pillow. It’s a fun and creative alternative to yet another basket. 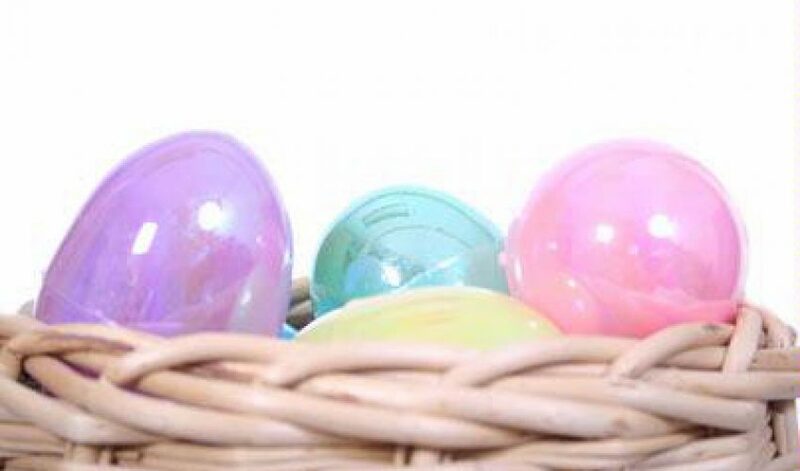 The contents of children’s baskets may vary from year to year, but they should always include one or more of the following: a stuffed animal, a Webkinz, a chocolate bunny to suit their size and shape, some plastic eggs filled with jelly beans and some individually wrapped candy that you know they like. I also include some healthy snacks like granola, nuts and sunflower seeds. For your fashion-forward tween or teenager, consider using a great looking handbag or satchel instead of a basket. They can use it for sleep-overs, for going to the beach or just for everyday fun. Be sure to include some cash, the ultimate recyclable. Last year, I made gardening bags containing small terra cotta pots, trowels, packages of flower seeds, small watering cans and potting soil to ignite the gardening spark. I have also gone with a beach theme in the past. I really love themed gifts, mostly because they are so much fun to put together. They can be done relatively inexpensively, but look like they cost a lot. And the kids really seem to get a kick out of them! The finished product whether for a child or adult will always include a fabulous, oversized bow. Make it yourself, and you get extra credit. There are a million instructional videos you can find online. One final note: I recently had the pleasure of having a friend show me the Easter basket that was once her Grandmother’s basket. Her mother was given this basket as a child and then it was passed on to the next generation. Today, she uses this basket for her nieces and nephews, as she has no children of her own. What a wonderful legacy and tradition to carry on. If this appeals to you, make sure you find a quality well-made basket that can stand the test of time and start your own tradition.